Love Shaker is the perfect gift idea for any occasion! Your kids will love it! You can shake love on their pillow for a good night sleep and sweet dreams. Shake under the bed or closet to chase the boogie monster away. 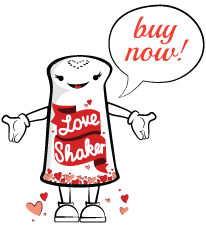 Love shaker is the magic friend that can save the day. Add love to your next celebration whether it be a party for a birthday, anniversary, holiday, bridal shower, wedding, baby shower or to simply make any day a celebration! Add a lot of love to your life!